No idea if this is account specific so check your emails! How is "I received an email with a free thing" a deal? What was the subject of the email? Oh wow now that's awesome, will have a look! Does it say on email why? Oh wow! Let’s hope it’s for everyone who owns the game! Thanks for the heads up. Assume you have digital copy of game? I'd like such an email. I would love to avail of this excellent Deal. Maybe show us some proof? Lets see that email op. Hmmm. Seems unlikely unless you bought some version of the game that included it, as and when it was released .. I'll hold onto my vote until it's confirmed. Hmmm. Seems unlikely unless you bought some version of the game that …Hmmm. Seems unlikely unless you bought some version of the game that included it, as and when it was released ..I'll hold onto my vote until it's confirmed. Methinks you'll be holding onto your vote for a long time. 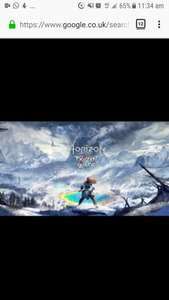 Just says on the email 'As you're a fan of Horizon Zero Dawn we're doing something special...we're giving you the huge expansion, Frozen Wilds - totally FREE' I owned HZD a while back. Checked the terms and conditions and can't see anything there that indicates eligibility. I'm sure I can't be the only one to have it though! Hold on, let me figure how to post a pic on this app. Wow enjoy Lee, I hope I get the email (spoiler: I won't ) . Sorry everyone, can't seem to find anything to indicate why I've recieved it. I didn't even own a copy of HZD as I borrowed from a mate and finished it. This was just the original version. I upgraded to a PS4 Pro yesterday, bought from GAME. Haven't done anything else. I'd like to think it's because I've been extra good this year but I know deep down it just isn't true. Anyway, hope people get it. Merry Chrimbo! Congrats on your good luck but this does not help me! If that's a mock-up then someone's gone to great lengths to make it. Otherwise this is a pretty cool offering. I'll keep my eyes on my e-mail inbox in any case. It definitely isn't a mock up. Have you noticed my crap editing skills! 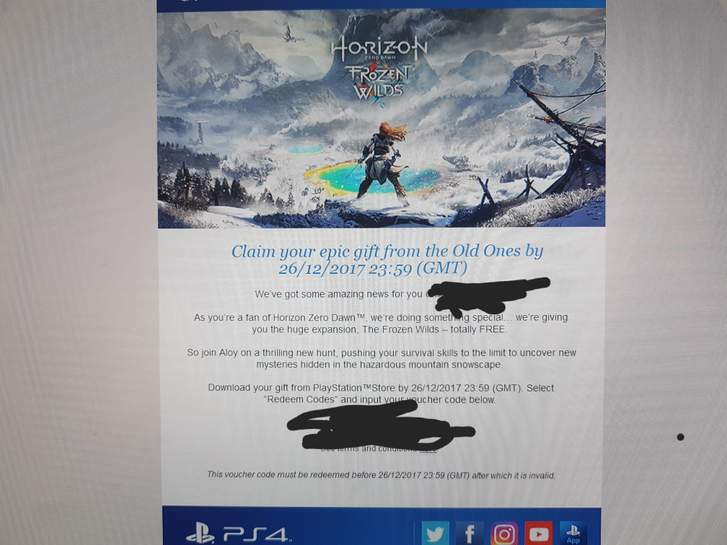 Just had a friend confirm he's recieved the email this morning. It doesn't read very well, punctuation and word selection are strange. Not one scrap of info on the internet about this or anything similar. Op, come clean and i'll give you a shiny flamedeer.